Now that we’re officially 11 days old, we are diving head first into our post-launch priority list. Our lead developer Paul, has been working hard on our new Stripe integration to bring you payment processing in TherapyZen and we hope to be showing it off pretty soon! 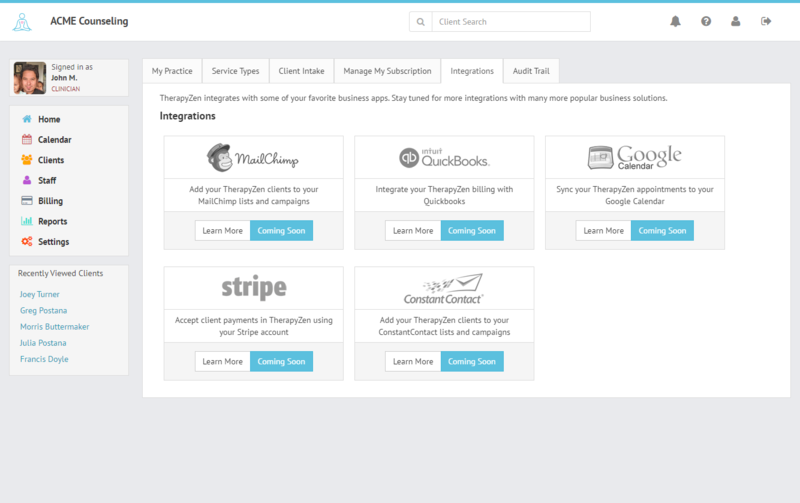 This is the first of many integrations we’ll be adding to TherapyZen including others like mailchimp and google calendar. Here’s a sneak peak at a few that we have picked out thus far. Why Stripe over all the other payment processors out there? We did a pretty extensive comparison of many different payment processors for integration with TherapyZen. We included all the standard criteria that you might expect including transaction fees, ease of setup, cards/payment methods accepted, support, and how ‘developer friendly’ they were. After quite a bit of research and testing, Stripe is our unabashed favorite. The team at Stripe built their entire product around the philosophy of removing the pain of payment processing. By sticking to this mantra, they have become hugely popular by creating an experience that is simple, presented beautifully and from a developer standpoint, a true breath of fresh air. We at TherapyZen try to live by these same ideas as well so it helped garner our favor for them. Stripe’s straight-forward pricing of 2.9% + $.30 per successful transaction are actually a hair higher than what can be found with some of the traditional processors, however unlike those traditional processors, Stripe does not charge a monthly fee. This transaction-based pricing model means that TherapyZen users will only be paying for processing services which will help you keep your overhead low. 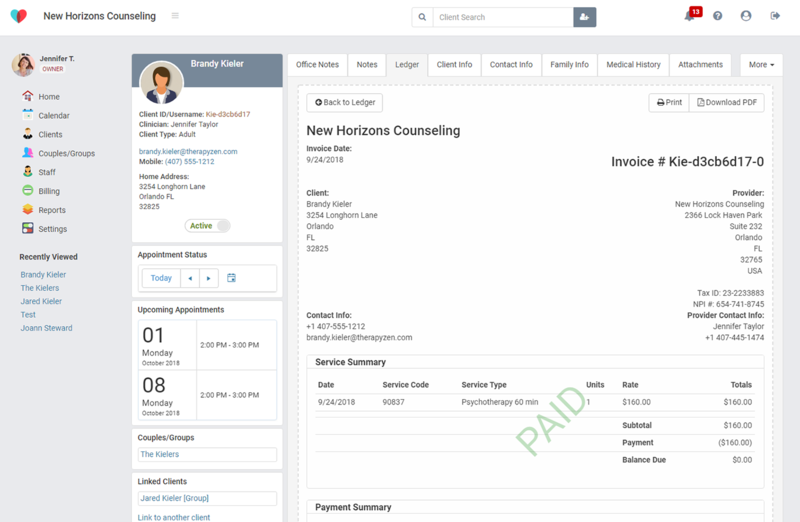 Our first priority is hooking into our own invoicing tools to let TherapyZen users collect payment for open invoices. At launch our goal was to make sure invoicing and superbilling was good enough to manage your client billing in an organized fashion, but by adding credit card processing, we’ll be streamlining that process even more. The second part of the Stripe implementation will involve placing payment options in the TherapyZen client portal to allow clients to pay their open invoices online. This will be a great way to build engagement with your clients by giving them more reason to utilize the portal that is included with your TherapyZen subscription. So that’s all for now, we’ll keep you posted on how this integration is coming along and we can’t wait to show it off soon! Feel free to post comments or questions below.